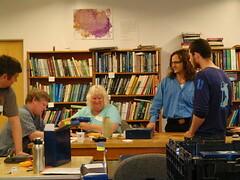 The first Followup for the DYF Teacher Institute II occurred on May 16, 2010 from 8am- 4pm at Humboldt State University. Links to the materials provided at the institute are available below. Seven DYF teachers attended Brooks Franklin, Ellen Osten, Rebecca Schuler, Errin Odell, Ken Pinkerton, Forrest Stamper, and Sheryl Steiner. The instructors were Lonny Grafman and Beth Eschenbach of the Environmental Resources Engineering at HSU. ERE students Elisabeth Johnson and Holly Leopardi presented the Windbelts RCEA kit and ERE student Bobby Voeks presented the Power Drill Generator RCEA kit. Teachers took home their own windbelt, a box of Engineering Go For It magazines, and Engineer Your Life brochures. In the morning Beth Eschenbach reviewed the importance of increasing the number of students interested in studying STEM (Science Technology Engineering and Mathematics). The DYF teachers discussed the importance of school culture and parent involvement to support students’ success in STEM. Errin reminded us of the 2020 Initiative: Decade of Difference and its focus on developing a culture in Humboldt County where all students are expected to graduate from high school and continue their education in a vocational, technical or professional area. Errin shared his story of visiting a school in S. California that changed its culture and in 5 years went from scores of 500 to 700. FHUS is experiencing its own culture shift. Students are tardy less and coming in at lunch to make up tests, because they do not want to perform required remedial work. Beth described the Family Engineering program being funded to NSF to help parents learn the importance of engineering. Brooks relayed a story of how involving parents correlated with a dramatic increase in test scores. Ken shared his recent epiphany that more science and engineering would be taught in classes if hands on activities required less prep or if teachers could have more assistance with prep from either parents, volunteers or students. Any kits designed for STEM K-12 education needs to have lower prep requirements. 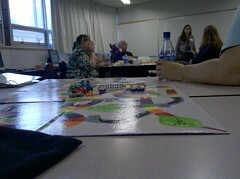 Participants discussed the current approach to teaching math is an emphasis is on “drill and kill” and not on projects. Some felt that some administrators are not as supportive of hands-on project because they require “stuff”, which can make a classroom “messy” and do not provide as many completed worksheets for accountability. Beth shared the National Academy of Engineers summary of 14 engineeirng challenges http://www.engineeringchallenges.org/ and the related K-12 site http://www.grandchallengek12.org/about which provide examples of how teachers can include the 14 grand challenges into science and math lessons. Ellen shared how her 4th period exploratory student worked with the HyTec electrolizer by showing them the DVD and let them figure it out. Then one group taught another group. Ellen let us know that Vince had the GATE kids meet with the school board and then design a playground. The students then presented their design to the board. The students like the fuel cell and the play ground. Next week they will make pasta bridges, by bringing their own pasta to school. Brooks shared pictures of the Engineering Club he started at EHS. Students met for 30 minutes for lunch to complete various activities such as the pasta bridges and Save the Penguins. Thirty minutes is not enough time to do a lot, and these students are not available after school. Brooks and the HROP teacher will be attending a conference at the end of the week on production. Ken and others shared about related engineering/project sites. After reporting out, the DYF teachers completed a pre-assessment. Lonny provided an overview of the Redwood Coast Energy Authority Kits project completed by the HSU Introduction to Design engineering students using a presentation software called prezi. Bobby Voeks introduced the Can You WorKIT activity to the participants. Teachers provided feedback on how the kits might work in their own classrooms. 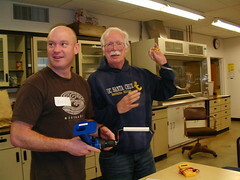 Oliver Hulland of the Redwood Coast Energy Authority and Lonny presented all the Redwood Coast Energy Authority Kits. Allison Oakland, Outreach Coordinator of the Schatz Energy Research Center also reviewed the kits. More here Lonny? DYF participants explore RCEA teaching kits. 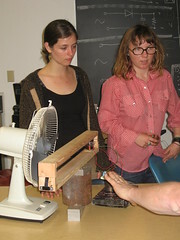 Elisabeth and Holly show how to tune a windbelt to produce more than 1 volt and light an LED. After lunch, participants met with Elisabeth and Holly and made their own windbelts, which was one of the RCEA kits. These windbelts were prepared ahead of time by Team Aero. 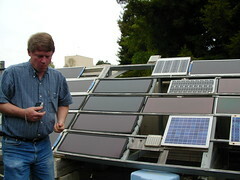 Ken learning about Arne Jacobson's research on PV panel quality for the Kenya PV panel market. During the break, participants visited the roof of Science D to learn more about ERE student and faculty research occurring in Kenya and Bhutan. The last part of the day was spent thinking about what the focus of the next DYF institute. Participants thought the community should know more about what engineering is and what students could be doing. They thought if parents knew what their children could be doing, they would request such coursework. Our next institute may include a public portion where participants share information about engineering education with the public. Another idea that was discussed was including a summer camp for students as part of a teacher development workshop. One idea was that each teacher would bring one or two students to experience engineering at HSU. Those students would serve as ambassadors to other students.